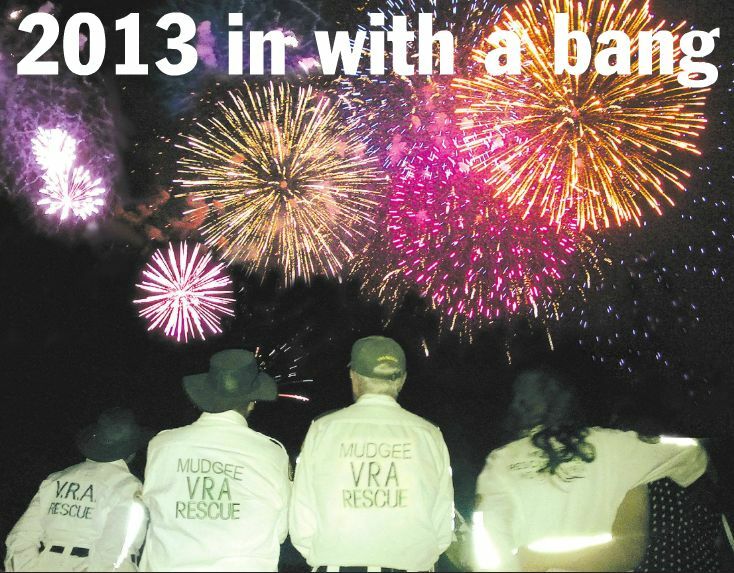 Mudgee Rescue Squad watch the fireworks over Parklands Resort on Monday evening, marking the end of a busy and successful 2012 for the squad. 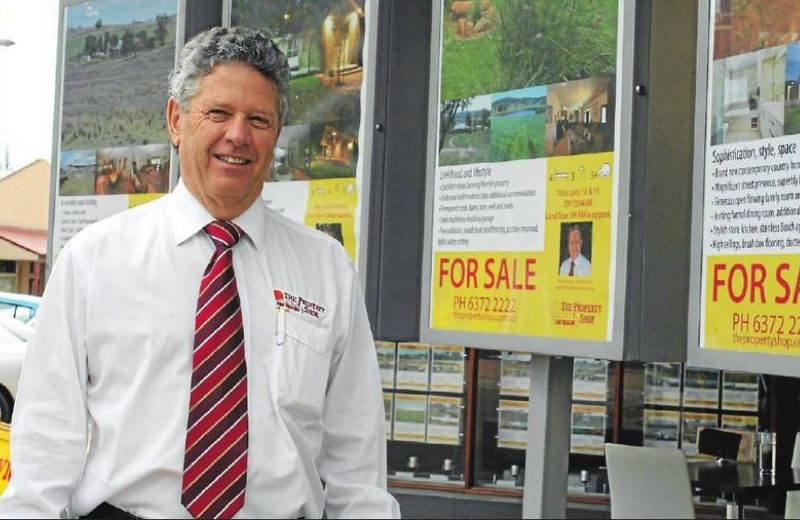 Property Shop Trades Auction in aid of Mudgee Hospital and Rescue Squad. Hugh Bateman from the Property Shop hopes Tradies Night on Thursday will see Mudgee’s generosity continue. This Thursday the Property Shop will hold Tradies Night, an annual fundraiser that this year will support the Mudgee Rescue Squad’s new truck campaign and the Mudgee Hospital Maternity Ward. Now in its fifth year the Tradies Night has always been held with the objective of supporting a local charity or cause of some description. On Thursday the Property Shop will hold a charity auction for the night. be NSW Cricket items donated by Brad Pettitt and Stephen O’Keefe, NSW Swifts netball items donated by Susan Pratley, and more. There will also be a raffle raising money. 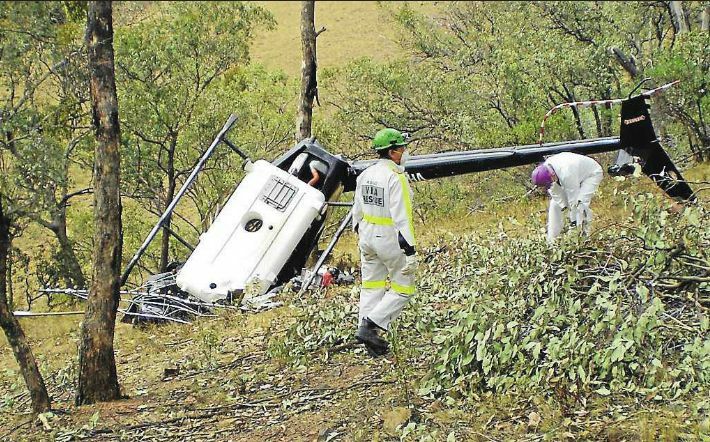 ACCIDENT SCENE: Emergency Services personnel at the scene of a fatal helicopter accident at Grattai on Sunday. A 48-year-old local man has died in a helicopter crash in bushland at Grattai, about 25km south-west of Mudgee, on Sunday. 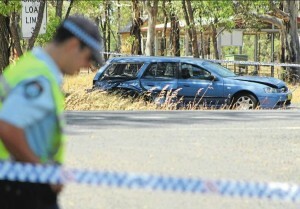 Police closed Ulan Road on Thursday following an accident that took the life of a 50-year-old local man. The car pictured is the station wagon which allegedly struck the man after he stopped to help another motorist on Ulan Road. A man who was struck by a car after he stopped to assist another driver was one of two people who died on Mudgee Roads over the Christmas season. The 50-year-old man had stopped on Ulan Road on Thursday to help another driver whose vehicle had apparently broken down. Police said lie was standing beside his own vehicle when he was hit by a blue Ford station wagon that was travelling north. Police were called to the scene outside the Mudgee Miniature Railway at around 9,20am on Thursday. The driver of the Ford, aged in her 311s, was taken to Mudgee District Hospital for mandatory blood tests. On Friday, no charges had been laid. 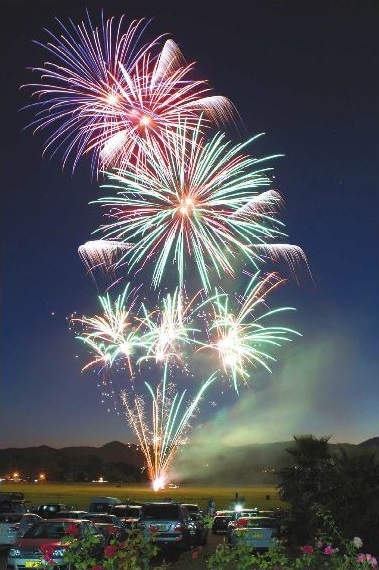 Fireworks will light up to sky above Mudgee as Parklands Resort helps bring in the New Year. The New Year’s Eve event will be very similar to last year with the only big change the fundraising recipient of the night. This year, all proceeds and donations made on the night will go towards the Mudgee Rescue Squad to help with the purchase of their new truck. ‘The fireworks will begin at 9pm and the restaurant will be open for dinner beforehand. Vivian Ware form Parklands Resort said. “The restaurant may open early so there’s enough time for people to enjoy their meal and then get settled on the grass outside in time for the fireworks” Everyone is welcome to come. Space will be available if people wish to bring along their own rug and picnic basket to watch the sky come alive with colour. As well as dinner and the fireworks Parklands Resort will open up the Windamere Room and help entertain the partying crown with a Dj for those over 18s in attendance. The Windamere Room will also offer bar facilities and there will be a jumping castle outside for the kids, The Dj will continue to play throughout the night as the countdown to midnight begins. Bookings for dinner on New Year’s Eve will be essential as tables may he snapped up fast. Restaurant bookings can be made by calling 63728399. Mudgee Rescue Squad has reached its fundraising target of $115,000 to buy a new rescue truck, even surpassing it to move towards a new back for the truck. Mudgee Hugh School’s Year 12 fundraising contributed $22,169.35 to push the project over the line, taking the total raised to $117,000. Geoff Hawes president of the Rescue Squad said the total was reached thanks to the dedication and generosity of people and organisations in the Mudgee region that took the project to their hearts. Mr Hawes said the town deserved a pat on the bark for responding to an Important project that would benefit Mudgee and the district for years to come and make an important addition to the region’s emergency rescue capability. 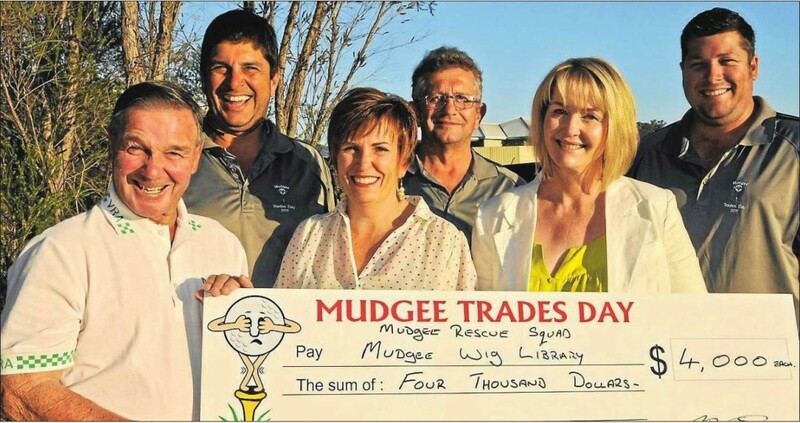 He said Club Mudgee deserved special mention for starting the appeal and pursuing it zealously, along with service clubs, mines, council, and the many individuals who made donations, bought tickets and attended barbecues Every donation has contributed to this success story, small and large,’ he said. The group had originally hoped to reach its target mid-2013, but support from the community and events such as The Property Shops Tradies Night accelerated the process and gave the group confidence to move into a second phase of fundraising. The squad is constantly raising money to pay for its fuel and operational expenses and will new work toward raising between $30,000 and $40,000 to fit the truck with a new back compartments and racks to hold power leads and tools. Parklands Resort will contribute funds raised at it’s New Years Eve fireworks display to the project. The Rescue Squad has already spoken to Complete Steel about designing the new back, and on Monday will start negotiating with the truck companies to buy its new vehicle. 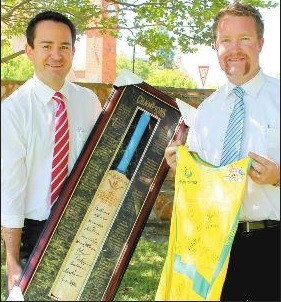 Damian Kearns and Lucas Sheppard with an autographed cricket bat and Australian netball uniform donated to be auctioned at Thursday’s Tradies Night. A cricket bat signed by the greats of the world is a late addition to the Tradies Night auction this Thursday’ Tradies Night is an annual fundraiser that this year will support the Mudgee Hospital maternity ward and the Mudgee Rescue Squad’s fundraising campaign for it’s new truck. On Thursday at the Property Shop will hold a charity auction for the night. Local cricketer enthusiast James Hickey donated the cricket bat, with signatures from players such as Viv Richards, Greg Chappell, Garfield Sobers and Ian Botham, with a combined total of 804 tests between them, 45,488 runs, 117 centuries and 1625 wickets. Other auction items include NSW Cricket items donated by Brad Pettitt and Stephen O’Keefe and an autographed Australian Netball Diamonds uniform from the 2010 Commonwealth Games donated by netball player Susan Pratley. The night will also include a raffle and barbecue. Members of the community are invited to join in the Tradies Golf Day at the Mudgee Golf Course this Friday, from 7. 30am. The annual golf day, organised by tradespeople from the Mid-Western Region, has been running for more than 30 years, supporting local charities and causes. This year’s Tradies Day is supporting the Mudgee Rescue Squad and Mudgee Hospital Maternity Ward. You don’t have to be a tradesperson to join in: Just turn up at the Mudgee Golf Course ready to take part in the four-ball Ambrose competition. Bring your own team of four or if you haven’t got a team, partners will be found for you. The cost of $75 includes all refreshments. 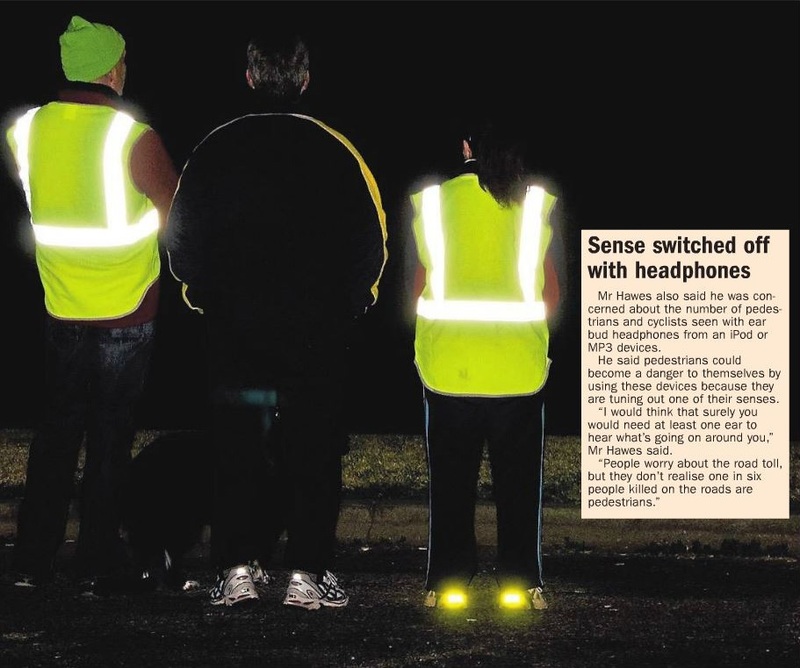 LOOK CLOSELY: This photo shows that clothing people think is high visibility (the yellow stripes on the sleeves of the person in the middle) is anything but when compared to reflective vests, The picture was taken as part of a Cudgegong Camera Club project. 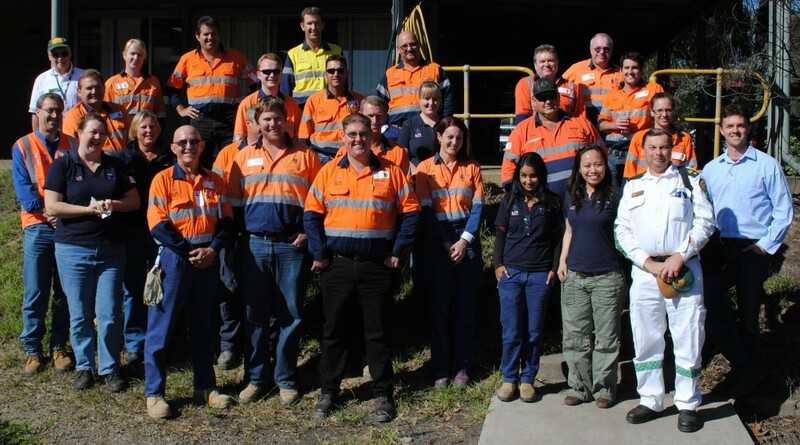 Mudgee Rescue Squad representatives: Doug Grigg (top left) and Garry Dollisson (second from right) join Parsons Brinckerhoff’s weekly fundraising barbecue. The company voted to support Mudgee Rescue Squad’s current efforts to purchase a new vehicle. Parsons Brinckerhoff (PB) have stepped on board the Mudgee Rescue Squad’s (VRA) appeal for a new truck. The Property Shop has donated $10,600 to the Mudgee Rescue Squad, which is half of the money raised at their successful Tradies Night. Mudgee Rescue Squad Publicity Officer Errol Grieve said they couldn’t believe how much the fundraising night raised. “What a phenomenal outcome, it far exceeded our expectations and we’re eternally grateful to the Mudgee community for what they’ve done and their generosity,” he said. Property Shop Director Andrew Palmer said the money will go towards a worthwhile cause and thanked those that made the amount possible. “It was a fantastic night, as a business we’re very happy to support such an important community organisation and express our thanks to the trades community for their generosity,” he said. The Property Shop had originally set a target to raise about $7500 from the night but ended raising close to $22,000. Half of this amount will go to the Squad, the other will be given to the Mudgee Hospital Maternity Ward who are looking to buy window shutters. The night also raised $4000 for the business’s November fundraising. Around 110 people attended the annual fundraising event, which is also when the Property Shop thanks the local trades people who carry out work for the real estate agent. Mr Grieve said the “future looks bright” for the Squad as they choose the model of truck they will purchase and look towards a new back for the vehicle. They hope to have their new truck by March. Volunteers Week “Giving back to the community”.